Using some simple tips and easy projects, you can transform your mudroom or laundry room into an efficient and pleasant area. It doesn’t take much to shape up these multi-purposes rooms from chaos to cozy space. Make your mud and laundry rooms flow with the decor of your home to make it a fun and functional space. Here are 7 ways to help you do just that. 1. Use Every Space. One of the smartest things to do in a laundry or mudroom is to utilize space under shelves and appliances, if you use stackable washing and drying equipment. Thoroughly clean out space under shelves and hampers so dirty shoes can slide in with ease. Position a lovely throw carpet or towel to collect dirt and grime while keeping shoes out of the way. 2. Keep It Light and Bright. With a mudroom, the adage “less is more” is the one to use when deciding on furniture. Keep it simple and austere, but choose color schemes and furniture that are inviting. Colors such as sea grass, sky blue, and pastel yellow are perfect for the mudroom. 3. Clear the Floor. Use wall mounted shelves and hat/coat hangers and hooks to continue with the less is more theme in the mudroom. Keeping things at a reachable level while also keeping clutter off floors makes the space a much more inviting and comfortable space upon entry. simple. 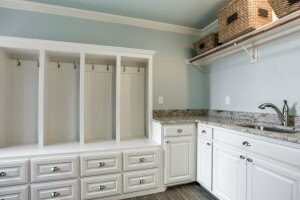 Consider having an open closet with shelves installed in the mud or laundry room to make everything you need accessible, yet tucked away. Use the same colors to keep the visual flow inviting and warm. To avoid a mess and cluttered look, use stackable plastic cabinetry to hold detergents, cleaning supplies, and other items that create a visual disturbance to the space. 5. Arrange Your Furniture. When adding a piece of furniture, say a chair, to the space, position it so there is a floor mat next to it and they are both by the door. This way, dirt and mud stays on the floor matt as shoes are removed. The chair just makes the process more comfortable and easier. 6. Personalize and Accessorize. To give the space a very homey touch, add a cork board or message board where notes can be left for members of the household. This gives the space a very relaxed and at home vibe and rounds out the space. 7. Maximize the Space. Open storage solutions such as baskets are a great way of maximizing small spaces. Keep hats, gloves, and other daily wear in the baskets to avoid clutter in the mudroom. Does your laundry or mudroom need a facelift, or do you need to create one? Click here to request an estimate or give us a call at 972-377-7600.